SARATOGA SPRINGS, NY—Discover Saratoga is excited to announce the winners of the 20th Annual Chowderfest, which was held on Saturday, February 3. 20th Annual Chowderfest long-sleeve t-shits, beanies and recipe books are still available for purchase at the Saratoga Springs Heritage Area Visitor Center. 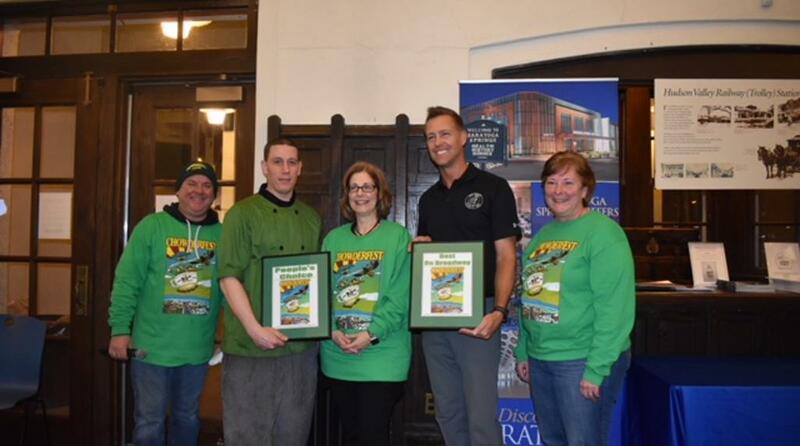 20th Annual Chowderfest was presented by DeCrescente Distributing Company and was made possible by our sponsors: 99.5 The River, Saratoga Springs City Center, D.A. Collins Companies, Driscoll Foods, Q103, Saratoga.com, Saratogian, Westminister Bakers Co., WGNA, WPYX, Saratoga Casino Hotel, Clipper Magazine, Courtyard by Marriott Saratoga Springs, Fingerpaint Marketing, Stewart’s Shops, Lia Auto Group, Saratoga County Chamber of Commerce, Saratoga Today, Wilton Mall, Adirondack Trust, Amsterdam Printing, Bonacio Construction, Inc., Mc Gregor Links, Prime at National Saratoga, The Wine Bar, Lyft, Leah Filter Gutter Protection, Green Mountain Power.